Blue Print Abs Sensor Nissan Micra Note Sunny IX OE Quality ADN17164 - Free Delivery from Simply Car Parts - Brand New BluePrint part - 3 Years Manufacturers Warranty. Blue Print Rear Right Abs Sensor Nissan Micra Note Sunny IX OE Quality ADN17166 - Free Delivery from Simply Car Parts - Brand New BluePrint part - 3 Years Manufacturers Warranty. Blue Print Rear Left Abs Sensor Nissan Micra Note Sunny IX OE Quality ADN17165 - Free Delivery from Simply Car Parts - Brand New BluePrint part - 3 Years Manufacturers Warranty. NISSAN MICRA MODELS FROM 2009-2012. NISSAN SUNNY MODELS 2011 - ONWARDS. NOT SURE IF IT WILL FIT YOU CAR ??. Part No : ADN17132. NISSAN SUNNY B15 1998-04 1.3i FWD 5 MTM ATM QG13DE B15 Right Hand Front 08/00>10/03. NISSAN SUNNY B15 1998-04 1.5i 4 x 4, 5 MTM ATM QG15DE FNB15 Right Hand Front 08/00>10/03. NISSAN SUNNY B15 1998-04 1.5i FWD 5 MTM ATM QG15DE FB15 Right Hand Front 08/00>10/03. Part No : ADN17131. NISSAN SUNNY B15 1998-04 1.3i FWD 5 MTM ATM QG13DE B15 Left Hand Front 08/00>10/03. NISSAN SUNNY B15 1998-04 1.5i 4 x 4, 5 MTM ATM QG15DE FNB15 Left Hand Front 08/00>10/03. NISSAN SUNNY B15 1998-04 1.5i FWD 5 MTM ATM QG15DE FB15 Left Hand Front 08/00>10/03. Blue Print Front Right Abs Sensor Nissan AD 4WD Almera Sunny Wingroad 4 ADN17132 - Free Delivery from Simply Car Parts - Brand New BluePrint part - 3 Years Manufacturers Warranty. Pair of ABS Reluctor Rings. Equivalent to OEM: Ring Type: 42 Tooth. Labour claims are never accepted. At AMS we know how difficult buying car parts can be, but we do everything we can to make it as easy as possible. Pair of ABS Reluctor Rings. Nissan Sunny III (N14) All Engines 1990 - 1995 Front. OEM Number: Ring Type: 42 Tooth. Any models shown in the application table are just a guide. TIE ROD AND STABILISER LINK. APEC WEAR INDICATOR, BRAKE PAD. FEBI QUALITY STRUT MOUNT. 2 Year Warranty Febi Anti-Friction Bearing, suspension strut support mounting. FEBI OE PRODUCTS. DENSO SENSOR. Blue Print Filter Service Kits. Blue Print Front Left Abs Sensor Nissan AD 4WD Almera Sunny Wingroad 4W ADN17131 - Free Delivery from Simply Car Parts - Brand New BluePrint part - 3 Years Manufacturers Warranty. Pair of ABS Reluctor Rings. Nissan Sunny III (N14) All Engines 1990 - 1995 Front. This item is equivalent to the following OEM numbers: Ring Type: 42 Tooth. All of our products are sourced directly from our range of approved factories. New Genuine BLUE PRINT ABS Anti Lock Brake Wheel Speed Sensor ADN17131 Top Quality 3yrs No Quibble Warranty. Heater Motors. Abs Sensors. Clutch Kits. Fan Couplings & Magnets. Belt Tensioner Wheels & Bkts. New Genuine BLUE PRINT ABS Anti Lock Brake Wheel Speed Sensor ADN17166 Top Quality 3yrs No Quibble Warranty. Heater Motors. Abs Sensors. Clutch Kits. Fan Couplings & Magnets. Belt Tensioner Wheels & Bkts. 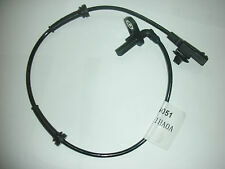 New Genuine BLUE PRINT ABS Anti Lock Brake Wheel Speed Sensor ADN17164 Top Quality 3yrs No Quibble Warranty. Heater Motors. Abs Sensors. Clutch Kits. Fan Couplings & Magnets. Belt Tensioner Wheels & Bkts. New Genuine BLUE PRINT ABS Anti Lock Brake Wheel Speed Sensor ADN17132 Top Quality 3yrs No Quibble Warranty. Heater Motors. Abs Sensors. Clutch Kits. Fan Couplings & Magnets. Belt Tensioner Wheels & Bkts. TIE ROD AND STABILISER LINK. OPEL KADETT E (33_, 34_, 43_, 44_) 1.6 i. APEC WEAR INDICATOR, BRAKE PAD. BALL JOINTS OE QUALITY. FIRSTLINE BALL JOINTS. LEMFORDER BALL JOINTS. DENSO SENSOR. Blue Print Filter Service Kits. Part Number:8540 14407. Numb.of teeth,ABS ring Then at our discretion we will decide the next course of action. chassis number (VIN) and we will confirm the correct part required. You will also get. New Genuine BLUE PRINT ABS Anti Lock Brake Wheel Speed Sensor ADN17165 Top Quality 3yrs No Quibble Warranty. Heater Motors. Abs Sensors. Clutch Kits. Fan Couplings & Magnets. Belt Tensioner Wheels & Bkts. TIE ROD AND STABILISER LINK. APEC WEAR INDICATOR, BRAKE PAD. BALL JOINTS OE QUALITY. FIRSTLINE BALL JOINTS. LEMFORDER BALL JOINTS. DENSO SENSOR. Blue Print Filter Service Kits. APEC WHEEL BRAKE CYLINDER. ABS ring sensor ring 42 teeth forward p o re. for Nissan sunny III N14 Y10. Number of Teeth: 42. Fitting Position: Front Axle left. Zähnezahl 42. Product no. : 76523. The comparison numbers serve only for better identification. Nissan SUNNY III (N14) 1.4 i 16V 1.4 L / 1392 cc 1990.10 - 1995.06 64 Kw / 87 HP Fitting Position: Front Axle. Nissan SUNNY III (N14) 1.4 i 1.4 L / 1392 cc 1990.10 - 1995.05 55 Kw / 75 HP Fitting Position: Front Axle. Part Number:8540 14401. Numb.of teeth,ABS ring Then at our discretion we will decide the next course of action. chassis number (VIN) and we will confirm the correct part required. You will also get. ABS control unit Nissan SUNNY III Traveller (Y10) (11.90-3.00). Hydraulic unit ABS Nissan SUNNY III Traveller (Y10) (11.90-3.00). Model - C3 I (FC_). Position - right. Year - 2004. If achassis number is specified, you can use this to check with your dealer whether the parts fit. This is a quality tested, used spare part! Parts are fully functional but you should expect normal wear corresponding to the year and milage of the car the part has been removed from. N14 Y10 N15 CD20 GA14DE GA14DS GA16DE GA16DS GA16DEL SR20DE SR20DET CD17. Manufacturer Part Number 8540 14407. Number of Teeth, ABS ring 42. Use engines info and vehicle YMM compatibility chart for general guide. ABS rings / sensors. Produktgruppe ABS Ring. Produkttyp ABS Sensorring. Fitting Position: Front Axle left. EAN Nicht zutreffend. OEM reference numbers MAPCO 76523 NK 392230 TRISCAN 8540 14401 KAWE 8540 14401 ODM MULTI part 26-060003 VEMO V38-92-0004. Reference Numbers N14 Y10 N15 CD20 GA14DE GA14DS GA16DE GA16DS GA16DEL SR20DE SR20DET CD17. Number of Teeth, ABS ring 42. Use engines info and vehicle YMM compatibility chart for general guide. Strictly important to provide VIN along with your detailed request since there can be different options for your car specific tech characteristics. 579: 4785065Y00 12000090171 Nissan Sunny ABS Computer 1993. 579: 4785065Y00 12000090171 Nissan Sunny ABS kompiuteris 1993. 579: 4785065Y00 12000090171 Nissan Sunny Блок управления АБС 1993. Parts codes: 4785065Y00 12000090171. MAPCO 76523 Sensor Ring, ABS - Picture-1. MAPCO products have been sold with enormous success in Germany since 1977. Over the last 40 years millions of MAPCO products have been fitted to a multitude of different vehicle applications.